The San Diego Symphony, conducted by Professor of Music Steven Schick, opened the “It's About Time” festival at Copley Symphony Hall Jan. 13. Photos by Erik Jepsen/ UC San Diego Publications. Organized by UC San Diego Extension, two Helen Edison Lecture Series events are an official part of the festival, starting Jan. 20 with a hosted discussion on jazz great Charles Mingus’ historical “Tijuana Moods” album. “It’s About Time: A Festival of Rhythm. Sound. And Place” explores the many ways music connects individuals to the world and nature, moving audiences from campus and the concert halls into the community at large. 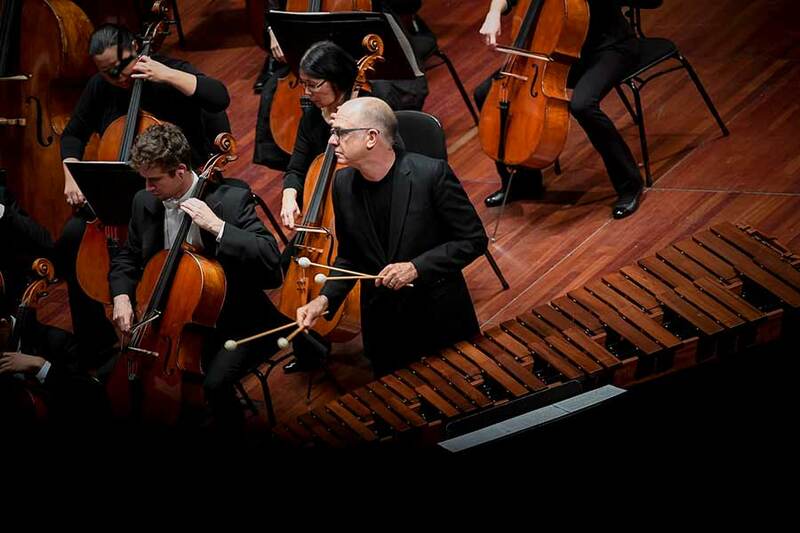 The Department of Music’s Steven Schick, who has long been uniting the regional music community as professor, conductor, music director and mentor, curated the San Diego Symphony-led festival, now in its third year. Launched Jan. 11 with the first of three “Percussion Lovefest” concerts, the festival highlights true collaboration for some of the top arts and music organizations in the region. 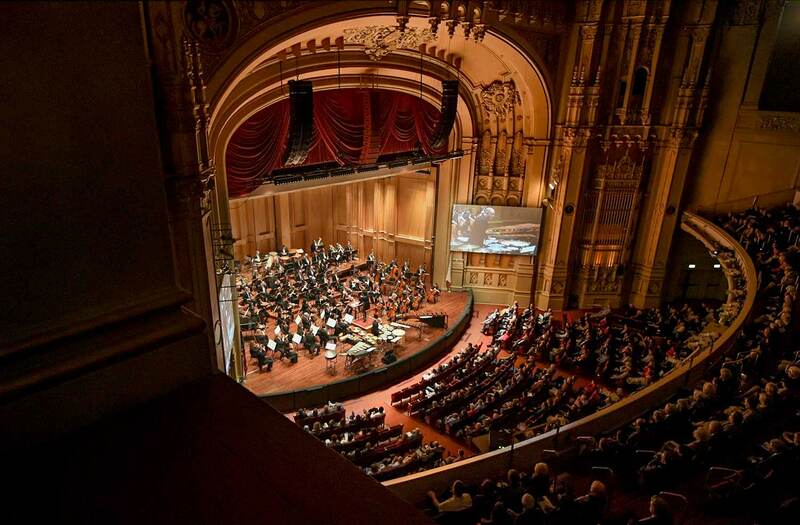 In addition to the San Diego Symphony and UC San Diego, partners in the festival include the La Jolla Symphony and Chorus, San Diego Opera, La Jolla Music Society, the Tijuana Cultural Center (CECUT), Athenaeum Music & Arts Library and Fresh Sound. “This festival is about the rich world of rhythm and the way we hear musical time. It’s about listening to the sounds of the outside world, to our own heartbeats and to noises of contemporary life,” Schick said. For UC San Diego, representation in the festival runs deep. The Department of Music ensemble red fish blue fish, conducted by Schick, is featured in multiple festival performances, starting Jan. 16 in “Percussion: A Listener’s Guide” at Copley Symphony Hall, downtown. On Jan. 20, the group performs with the Paul Taylor Dance Company in a rhythm spectacle combining live percussion with dance, presented by the La Jolla Music Society. Steven Schick, who holds the Reed Family Presidential Chair in Music at UC San Diego, curated the festival, running through Feb. 11. Themes of the border region—from Urrea and Terrazas’s performance, to multiple nights of “Tijuana Moods”—run deep in the festival. Collaborations literally straddle the border: On Jan. 27, a free concert held at International Friendship Park will bring 60 musicians together, performing the deeply moving “Inuksuit” on both sides of the border fence near the ocean. “Inuksuit” is written by John Luther Adams, whose “The Wind Garden” installation is the final spot on the Jan. 20 Stuart Collection walking tour. “It’s About Time” opened Jan. 11 and runs through Feb. 11 with the final concert presented by the La Jolla Symphony and Chorus. Schick will lead a pre-concert discussion, then conduct “Cross Winds,” written by Auzet. Individual tickets for the entire festival and the complete schedule—including locations across the region—can be found at the “It’s About Time” website, with multiple shows offering free or reduced pricing for students.